Champlevé Enameling | Metalwerx, Inc.
Champlevé is a French term that describes enamels that are inlaid into designs made of metal with higher fields and recessed compartments. One of many ways to achieve these surfaces is through a sustainable electrolytic etching process. Over the course of a three-day workshop, students will have the opportunity to learn how to modify drawings and designs to be compatible with Champlevé, apply resist to metal, etch, wet pack, fire, stone, and finish wearable works of art. Marissa Saneholtz makes narrative based jewelry and objects using humor and sarcasm to comment on gender roles in American society. 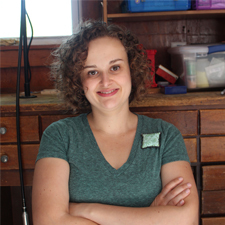 She has been published in several books, including Art Jewelry Today II edited by Jeffery Snyder, Humor in Craft by Brigitte Martin, and Narrative Jewelry: Tales from the Toolbox by Mark Fenn. Her work has been exhibited both nationally and internationally and is in the collections of the Dorothy McKenzie Price Permanent Collection at Bowling Green State University, the Racine Art Museum in Racine, WI, and the Enamel Arts Foundation, Los Angeles, CA. Currently, she is teaching at Bowling Green State University in Bowling Green, OH. There is a $45 materials fee for this workshop that is payable upon registration. The materials kit for this class includes a 6" x 12" piece of 14g copper, saw blades, materials for etching, use of enamels and enameling tools, as well as various materials required to complete samples. Any other copper, brass, nu gold, nickel silver, or sterling silver you may want to work with. Feel free to bring any other sort of tools that you like to work with!